Tachycardia is a heart rate of more than 100 beats per minute. The heart normally beats at a rate of 60 to 100 times per minute, and the pulse (felt at the wrist, neck or elsewhere) matches the contractions of the heart's ventricles, the heart's two powerful lower chambers. Tachycardia can be part of the body's normal response to anxiety, fever, rapid blood loss or strenuous exercise. It also can be caused by medical problems, such as an abnormally high level of thyroid hormones, called hyperthyroidism. In some people, tachycardia is the result of a cardiac arrhythmia (a heart-generated abnormality of heart rate or rhythm). 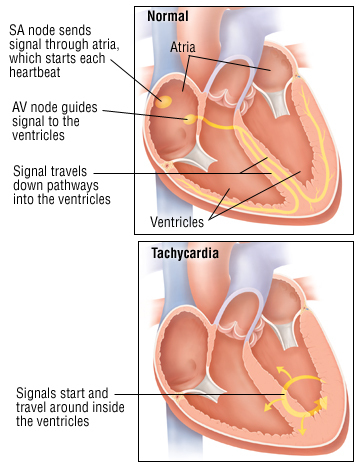 Tachycardia can also be caused by lung problems, such as pneumonia or a blood clot in one of the lung's arteries.